Current position and responsibilities: I’m the co-owner/vice president of Precision Compounding in New Albany, Ind. My responsibilities include managing the day-to-day operations – processing and checking prescription orders, counseling patients on appropriate use of their compounded medication, and making OTC, vitamin and nutritional recommendations. In addition to the normal duties of a pharmacist, I serve as the clinical specialist for the following areas: ophthalmics; urology; hormone replacement for women and men; pediatrics; cosmeceuticals; veterinary medicine; and pain management. I oversee all quality control operations in the sterile and non-sterile laboratories. I also precept students from both Butler and Purdue University. Major project/achievement of the past year: Last year, our pharmacy became accredited by the Pharmacy Compounding Accreditation Board (PCAB). This is a national voluntary accreditation board that was developed by the leading organizations in the pharmacy profession for the purpose of recognizing compounding pharmacies that have demonstrated their outstanding commitment to quality. Currently, there are only 100 PCAB accredited pharmacies nationally. The project took a year to complete. I was responsible for the creation and implementation of our standard operating procedures, staff training and education. 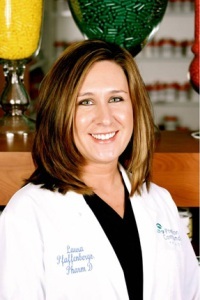 Why did you choose pharmacy as your career path: I met my business partner, Denise Orwick, through a family friend my senior year of high school. I shadowed her at her current job in a hospital pharmacy. She had experiences in many different pharmacy settings so we spent a lot of time talking about job responsibilities and opportunities in the pharmacy profession. I liked the idea of building on my strengths in chemistry and biology and helping people. Pharmacy as a career just seemed natural after learning more about it. How did Butler prepare you for your career: I received an exceptional education from Butler. My career path is very different than I ever thought it would be, but I was able to form a strong foundation through my education at Butler that I have continued to build upon. My clinical Pharm.D. rotations exposed me to many different practice settings which helped me diversify my skill set. I am now a leading and valued medication problem solver in the community to doctors, nurse practitioners and the general public. Most memorable experience(s) at Butler: My most memorable academic experience at Butler was the Pharm.D. rotation on complementary medicine. I was skeptical at first, but the rotation really opened my eyes to alternatives that existed for patients. I was able to learn about different things and see them work for people. It was the first time I became acutely aware of the importance of listening to people and not just focusing on a lab value. The rotation taught me the importance of being open minded. That is such a valuable lesson because no one has all of the answers. My pharmacy is a unique place. We are an integrative practice that offers solutions through compounding to patients. We have a wellness center and nurse practitionerswho work at our facility who practice integrative and functional medicine and utilize many different types of treatment modalities. My memorable Pharm.D, rotation started me on the career path that I am ontoday and has helped me make a difference in many people’s lives.